As the midnight curfew approaches and magic dissipates, the carriage falls apart and coachmen turn back into chatty mice, Cinderella looks sorrowfully into the distance, holding the only remaining piece of what seems to have been a dream: the glass slipper. Her dress is of remarkable beauty: blue, light pink, jade green, white, lilac, and gold interweave to create her truly magical attire. 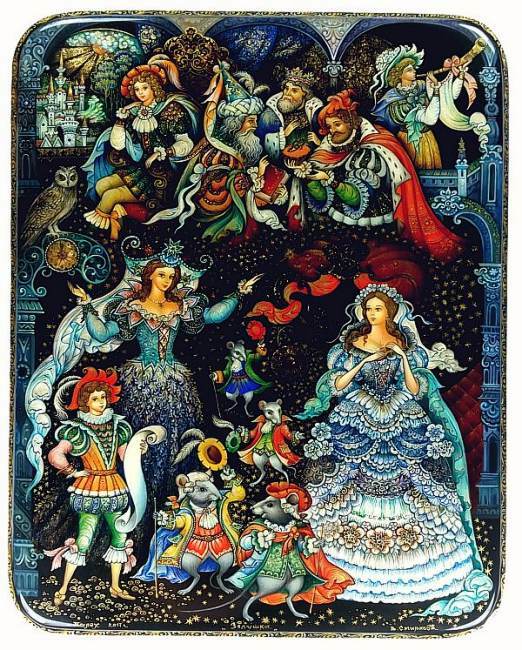 Her Godmother, to the left, is no less beautiful, holding her wand high, pointing to the middle of the scene, where the traces of burgundy and gold carriage are still visible. The Godmother's expression is that of wisdom and kindness: she knows that all of Cinderella's ordeals are going to end soon, and that she will be happier than ever. In the meantime, however, in the top part of the scene, the courtiers puzzle over the mystery of the miniature glass shoe. 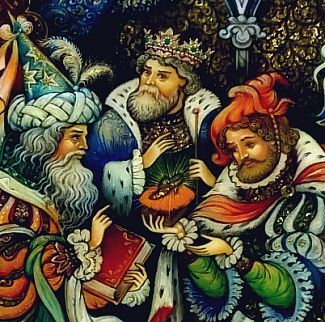 One of them is reverently holding the shoe up on a royal pillow, while the other seems to have an idea as to how to find the lost princess. The king, standing in the middle, is watching the two with a perplexed expression. His son, the prince, is depicted on the left, atop a throne, propping his head with his right hand. His expression is full of contemplation and sorrow - he appears lost in a dream of the moment when he saw the love of his life and wondering whether she will ever appear before him again. For now, not even the sun, shining brightly from his window all over the towers of the palace, can relieve his sorrow. The kingdom is bursting with energy: in the top right and bottom left corners of the scene, two young courtiers announce the search for the lost princess: one blowing the trumpet, while the other reads out the king's orders from a roll of papyrus. Perched atop a clock on the left is an owl, standing out with its gray colors against an otherwise radiant colors of the composition, and creating an asymmetrical balance in the scene. The gold stars sent out from the wand of Cinderella's Godmother add the final luminous touch of magic to this mesmerising scene. 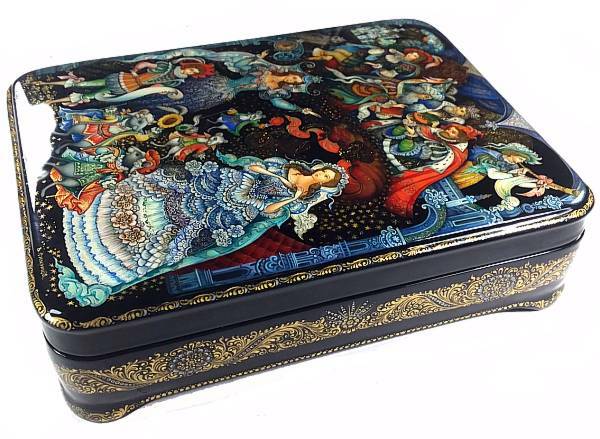 This magnificent work is painted on a high quality papier mache box. The scene is surrounded by gold and silver ornament, and a large, more complex one decorates the sides of the box. The box rests on four carved edges, each decorated with an ornament. The box has a hinge on the left, and opens to a red interior. The bottom is signed with the name of the artist (V. Smirnova), name of the composition, village, and year.